Monsters roam the surface of the Earth, killing and capturing any humans they come across. With bodies that seem indestructible and the ability to teleport, they rule while the citizens of this planet hide underground. 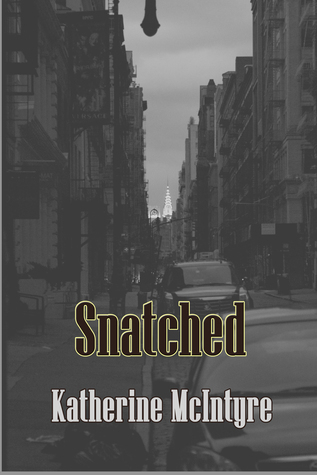 Katherine McIntyre shares this horrifying world with readers in her novel, Snatched. Kara, the main character, is an Orris girl - strong, sarcastic, and full of gumption. She's a seventeen year old military member who has just completed her first mission on the surface. Kara is an incredibly brave and serious soldier. Her focus is keeping her little sister safe. Especially since Lizzy is the only family she has left. Readers will connect with Kara through the book's point of view. Because everything focuses around Kara, readers will witness what Kara is fighting for. When Lizzy is snatched by the monster shifters, Kara is determined to do whatever it takes to get her little sister home safely. Her courage and loyalty play the biggest role in helping readers relate to Kara. The plot of the novel begins with Kara's first mission during which a shifter is spotted. Because of the sighting, another mission is immediately formed. Just before leaving for the mission, Lizzy is captured by the shifters. Kara keeps the news to herself and goes on the mission knowing that she'll find a way to track down, and save, her sister. Snatched is pretty fast-paced with the characters barely getting a moment of rest, though I felt like the timeline described in the novel didn't match up a few times. The writing style is horrifyingly detailed, especially the monster fighting sections, but became a bit repetitive. I felt like I was re-reading sentences every once in a while. Regardless, the book was absorbing. McIntyre does a good job creating a believable dystopian setting for the survive-and-rescue plot.